I don’t need to take a Dale Carnegie Course in How to Win Friends and Influence People. Instead, I can watch our little dog win over the affections of a feral cat and believe it will work on people. A year ago, I agreed to get another Shih Tzu on one condition: she couldn’t be a froufrou dog with ribbons in her hair and a diamond collar. Nosirreebob, I like tough little dogs that rumble in the bar on Saturday night then go to church on Sunday morning. Naming our dogs is kind of an evolutionary process. We started off with Pepper, but it soon extended to Peppernuts then I shortened it to just plain Nuts. She’s a tough little dog that spends every waking minute looking for someone to torment. Recently, my wife befriended a feral catch she named Patches. It took a while for Christine to win her trust, but once she did, the cat is ferociously affectionate to the point we wonder if it is really a cat; Patches acts more like a dog. Although Patches the cat likes the humans of the house, our other animals are not objects of her affection. However, Pepper will have none of that. Over the course of time, Pepper has won the cat over and I’ve learned a few things. Hey! Hey you! Yeah, you, the cat. I’m a dog. I like cats. Want to be friends? Pepper is not the sharpest knife in the cutlery set. Proximity: Although the cat was usually pretty clear on her lack of interest in a mutual relationship by baring her teeth and hissing, Pepper would get as close as she could without getting mauled. Four feet seemed to be the safe space that gave Pepper enough time to run if the cat turned aggressive. 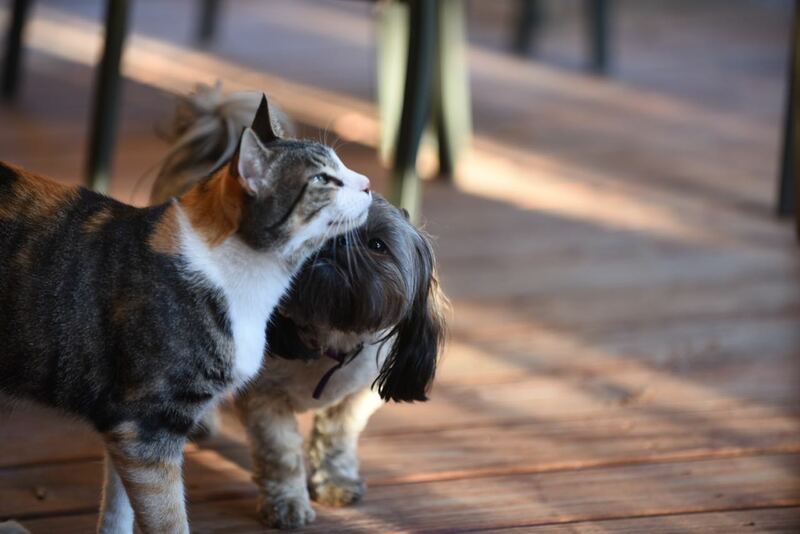 Patience: It took Pepper about six weeks to win the affection of the cat. In the sales and marketing world, it’s generally assumed that it takes six to eight touches to generate a real lead; few people buy the first time. Therefore, sales and marketing folks create various methods of getting in front of a potential customer six to eight times. Pepper probably had sixty. We’ve watched Pepper do so many dumb things that my wife and I now form a marble-sized circle with our thumb and finger and say, remember, her brain is only that big. Nonetheless, I’ve learned a few things from our little dog about how to win people over. But I’ll leave the barking to her. If you would like these writings delivered once or twice a week into your inbox, sign up here. I promise not to spam you or give/sell your info to anyone. Follow along on Twitter and/or on my authors’ page on Facebook.